This morning I didn’t hear the wake-up call from the village rooster. He’s there alright as I heard him a bit later in the day. It’s not that I needed to hear him or even desired to. It is that I am getting used to the slower pace. Waking at 8:00 AM is good! That also means that once I have performed the morning routine, breakfast shops will be soon opening around 9:00 or 10:00… One place is quickly becoming my favorite. Not only is the price good but the Andalucian food is too. 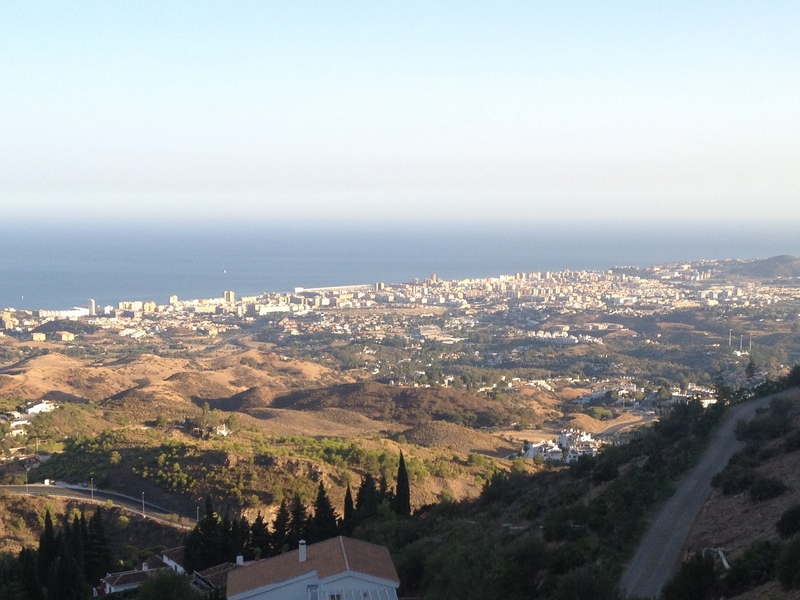 The place is “Bella Vista,” or Beautiful View, which it is as pictured with the Mediterranean Sea and the town of Fuengirola along its coast. My favorite mid morning meal is the “Andaluz.” This consists of fresh squeezed orange juice, cafe con leche, and pitufa. Pitufa is a six inch long fresh, baked bread, split lengthwise, toasted and topped with a smashed fresh tomatoes spread. These are served so you can add olive oil and/or salt to taste. They are delicious and for 3.50 Euros, the price is amazing! Of course there are plenty of other eating options, especially where you can get English breakfasts such as scones and cream tea, or tea, eggs, bacon, sausage, baked beans (or roasted tomato), toast, and blood pudding. The sausage isn’t especially pleasing to my taste and I will pass on the blood pudding. I like the generous portions but this is Spain! I will stick to the Andaluz. I took a bus into Fuengirola yesterday. 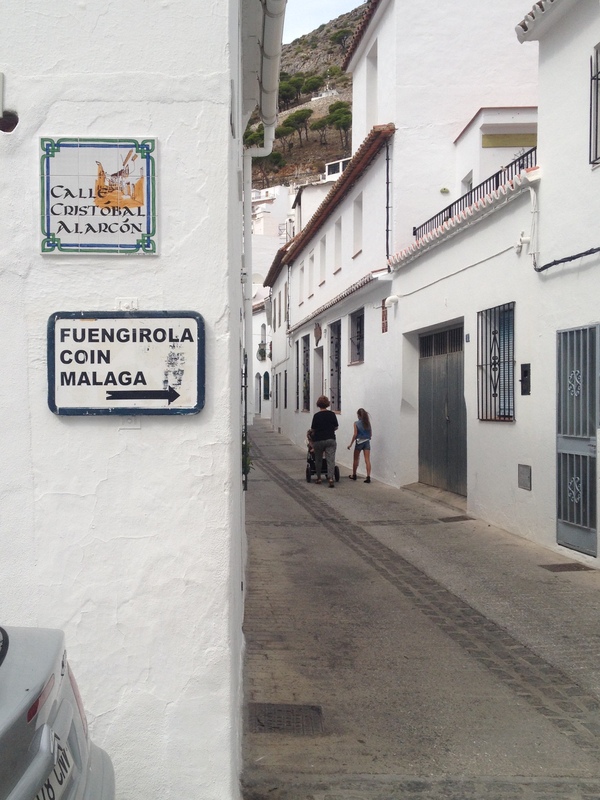 Recall the Mijas Pueblo is a village overlooking the seaside resort town. It was in the 80’s on 22 October 2014 so there were plenty of people on the beach. I went into town looking for backpacks but at 3:00 PM almost everything closed. I forgot that between 3:00 and 5:00 is quiet time. I have not heard it referred to as “siesta” but maybe it is and I will find out. Regardless, my shopping ended and I grabbed the bus for the 20 minute ride back to Mijas Pueblo. On the bus I was talking with three elderly women who were betrayed by their accents as not being Spanish. As they were speaking English, I asked if they were from the U.K. Well, the one sternly faced lady quipped proudly that they were not from the U.K., they were from Ireland. The bus quickly arrived in Mijas!! 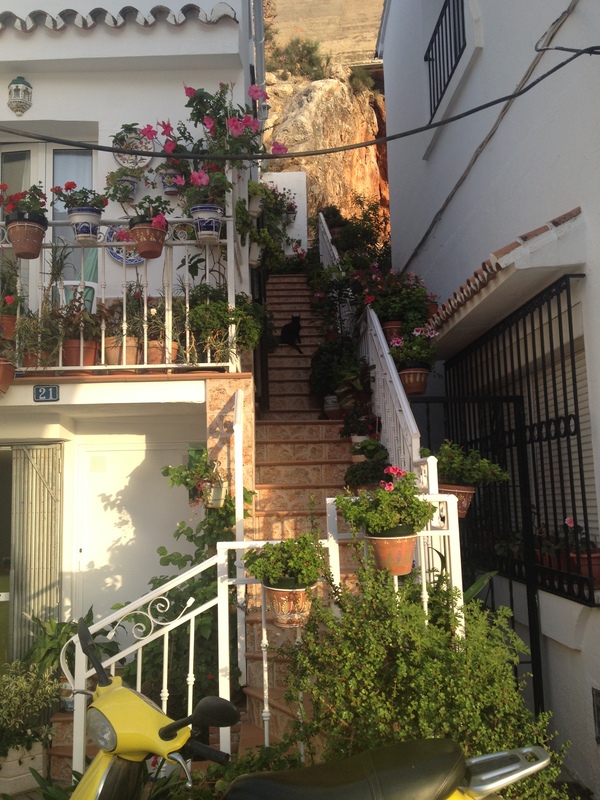 Below are some beautiful photos from Mijas. The narrow one-way street pictured is one of the main ways through town. The street is shared by motorists and pedestrians. When a car comes by pedestrians stop and gather along the house walls. Barry – Very very interesting. 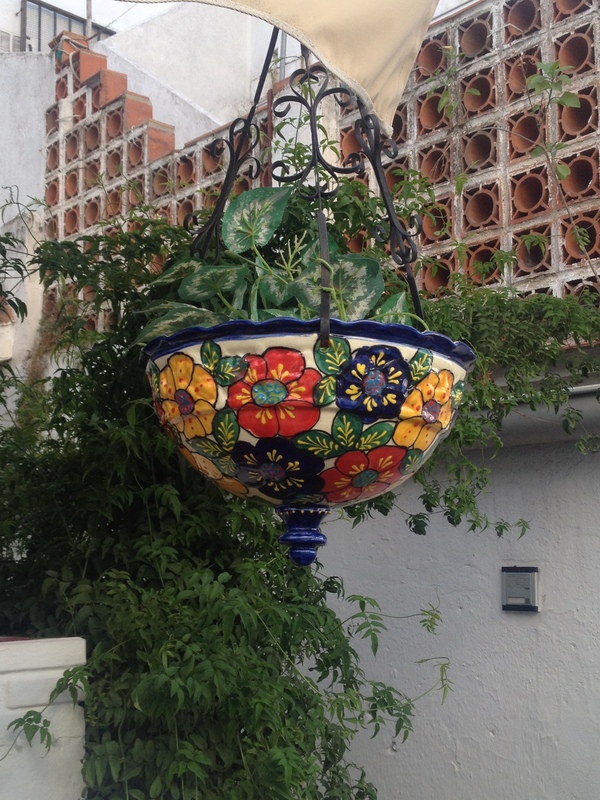 It certainly looks beautiful and I love the decorative pottery. I’m glad you take the time to do this. I certainly enjoy it. 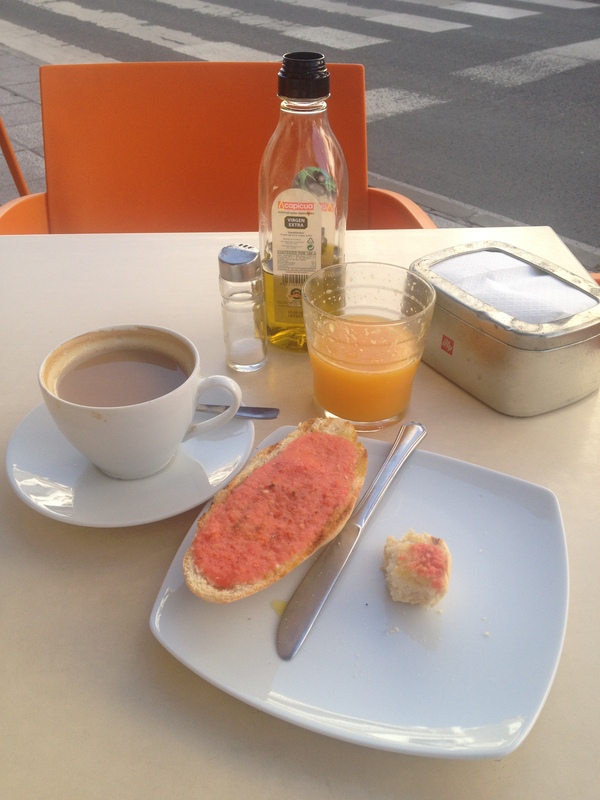 Lovin yur blog about Spain. My husband and I just celebrated our 25th wedding anniversary with 10 Days of n Spain. He has family on the north coast in Luarca. We went over to San Sebastián and then down to Barcelona. Had a great time driving the country. Why did u pick Spain to retire? Next Next post: Old People Out-and-About!